Driveways are one of the essential elements of every home. They can make or break the image of your home’s exterior. Due to regular vehicular movement, they are more prone to wear and tear. 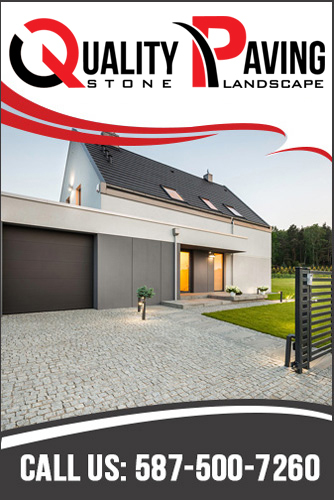 At Quality Paving Stone Landscape, our driveway contractors in Calgary have years of experience in installing, repairing and maintaining driveways. We pay attention to the length and thickness of the paving stone so that you can enjoy appealing driveways for years to come. Whether you want us to install a new asphalt driveway or need to repair the old one, we have you covered. Asphalt driveways enhance the look and feel of your home significantly. They provide a smooth and sound absorbing driving surface with an eye-catching finish. In winters, they also absorb heat and help melt the snow to ensure strong grip of your vehicle. Asphalt is one of the most durable and economical driveway materials. If there are just a minor cracks or fading in your surface, seal coating the best option for you. It gives an amazing shiny black finish while keeping the moisture out. If your driveway has large cracks or potholes, you should go for asphalt patching. Our asphalt contractors in Calgary will cut out the bad areas to give you a perfect driveway. Landscaping enhances the aesthetic beauty and increases the value of your home while contributing to its looks and integrity. By planting a few shrubs and trees in the yard and doing some amazing stonework along the walkway can do wonders. At Quality Paving Stone Landscaper, we are here to transform the outdated exteriors of your property with breathtaking lawns and picture-perfect yards. This is also known as driveway repaving. If your driveway has a good base layer, our professionals will add a new layer of asphalt to it to make it more robust. If your driveway is making your property look shabby, get it replaced by our professionals. We replace and install new driveways making your home look great. If you want to install or replace the driveway, just make us a call. Our trained and experienced contractors will come to inspect your surface and provide a free estimate. We ensure to complete every project in a timely and professional manner.